Not far from the rushing cars of the Don Valley Parkway, there might be a donkey braying for attention, or a farmer collecting eggs or milking a cow. 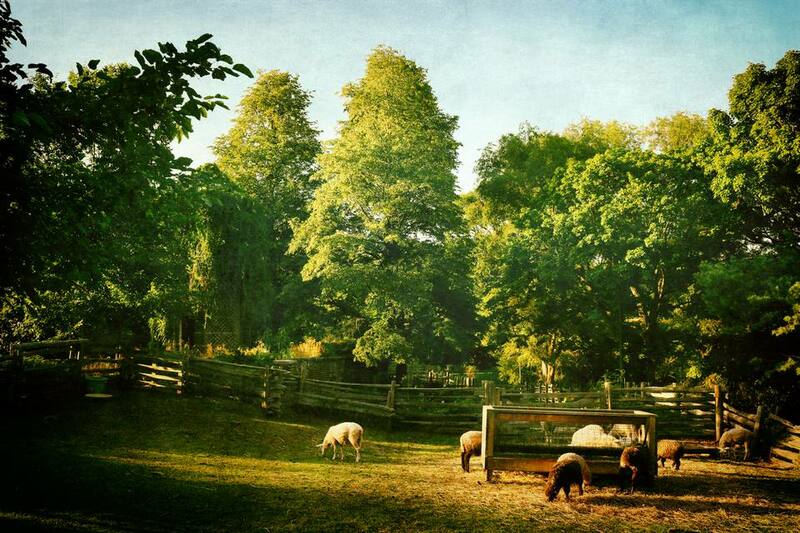 Welcome to Riverdale Farm, an oasis of calm farm life in the middle of Toronto. The farm makes for a fun afternoon out for families with young kids, or anyone wanting to escape city life - without actually leaving the city. Read on for everything you know about visiting. Riverdale Farm is free for everyone to visit, and is open year-round from 9am to 5pm, even on weekends and holidays. The kitchen and farm shop are open from 10am to 3pm. Just note that dogs, bicycles, in-line skates, foot scooters, ride toys, and vehicles are not permitted on Farm property. While the 7.5-acre farm is very scenic, most people still go for the animals. Regular residents of the farm include cows, horses, a donkey, sheep, chickens, pigs, goats, ducks, turkeys, geese and farm cats. A sow is often brought to the farm in the spring to give birth, so with the right timing you can see some piglets as well. Curious visitors can learn about farm life and chat with a farmer during daily chores like animal feeding, goat milking, horse grooming, cow milking and egg collecting. This is a fun way to learn about what life is like on a working farm. Just note that this isn't a petting zoo; animals here are for observing only. From May to October a farmer's market takes place near the farm in West Riverdale Park, at the cross streets of Winchester and Sumach. Formerly known as Riverdale Farmers' Market, it's now the Cabbagetown Farmers' Market and you can head there between 3pm and 7pm on a Tuesday to see what the local growers have in stock. Vendors vary, but may include Fifth Town Cheese, Madelines Bakery, Feast of Fields and The Bee Shop among many others. The city also runs several of their recreation programs at the farm, so check the Toronto Parks, Forestry and Recreation Fun Guide to see what classes are scheduled at the farm in the near future. For those interested in helping out and getting more involved in the community, it's possible to volunteer at Riverdale Farm. From May through October volunteers can help out farm staff with a variety of gardening activities. You can also volunteer on committees that make decisions about the farm's management by going through the city. Visit their Riverdale Farm website to learn more. Riverdale Farm isn't actually in Riverdale, sitting instead on the west side of the Don Valley in Cabbagetown. It's connected to Riverdale Park West and bordered by Winchester street to the north, Carlton to the south and Sumach Street to the west. Take the Gerrard streetcar to River Street. Walk north on River and you'll see a path into Riverdale Park West. Follow it and you'll soon see cows. Another TTC option is the Parliament bus to Winchester Street, which is a bit north of Carlton but makes for a nicer walk. Head east on Winchester and you'll end up at the north end of Riverdale Park West. The Don Valley Trail has a staircase north of Gerrard that goes up to the bridge connecting Riverdale Park East and West. Head west and follow the trail up the hill. But please note your bike is not allowed inside the farm (and neither are rollerblades), so please lock it up on the racks before you enter. If you're coming from the north, Bayview is likely your best option. Exit onto River Street, then make a right onto Gerrard, a right onto Sumach and a right onto Carlton. From the south you can come straight up Sumach, which connects to both Dundas and Gerrard. Riverdale Farm does not have any parking available especially for it, however there is street parking on Sumach and Winchester. There's also a small strip of parking on Carlton Street east of Sumach. The paths leading around the farm are paved, making them suitable for use by wheelchairs and other mobility devices. The washrooms are also accessible. Please note however that all of the pathways are fully exposed, so on days when it is snowing mobility will become a greater issue.